Is your group, professional association or academic society interested in hosting a meeting, conference, or seminar? 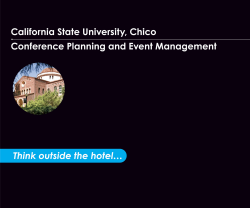 CSU, Chico's Conference Services team can help you plan, market, and execute a successful and memorable event on the beautiful campus of Chico State or anywhere around the world. Let our meeting professionals help you make your next conference your best. The Association of Collegiate Conference and Events Directors International has certified CSU, Chico as a 1 Stop Certified Conference Facility. This designation demonstrates to meeting planners that Chico is a high quality meeting location with an experienced conference planner who can act as the single point of contact for a successful event. Whether your event will host 10 or 1,000 (or more! ), CSU, Chico features a wide variety of indoor and outdoor venues available. In addition to our campus venues, we have successfully managed conferences and events in numerous locations throughout the state of California and around the world, including Marseille, France, Cologne, Germany and Gatineau, Canada. Our team is fully qualified to think and act globally, as well as locally. We welcome the opportunity to discuss your event and how we can work together to make it a success. Please contact us! We'll Put Our Experience to Work for You! Our conference services team can help you plan and manage a successful event on our campus or anywhere in the world! If you would like to explore ways we could work together, please send us an email and we will be in touch.